Perfect source code recovery solution for Visual Basic 5.0/6.0 applications and fast disassembler for Visual Studio .NET compiled apps. Best code recovery solution for Visual Basic 5.0/6.0 applications and fast disassembler for Visual Studio .NET compiled apps. Source code loss is a very serious problem for many software developers. As most Visual Basic 5.0/6.0 applications were developed a long time ago, their source code (.vbp, .frm, and .bas files) has already been lost due to migrating to a new computer, replacing a hard drive, etc. Based on the experience of most of our customers, we can say that losing source code can be a tragedy. Just imagine that you have written a program, spending a lot of effort, time, and money, but now all that is left is the compiled program (the EXE file with DLL libraries). Some day you may suddenly discover that your source code is gone. Maybe you have upgraded your PC or migrated your data to another cloud, or your hard drive just failed, and you do not have a backup. You are starting to panic. What should you do? Just take VB Decompiler and decompile most parts of your project! VB Decompiler will recover as much as possible of your source code with a higher success rate than any competitive product. Visual Basic has two different compilation modes: p-code (pseudo code) and native code (assembler). VB Decompiler can restore the source code from p-code as close to the original one as possible, so after a few modifications you can get some really workable source code. Of course, in case of a program compiled to native code, the decompilation success rate will be lower, but you still can recover up to 70 percent of the original source code. 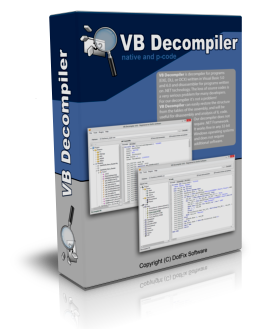 VB Decompiler has a few powerful built-in tools: an x86/x64 disassembler, an emulator for assembler commands, and a tracing engine. Thanks to them, the result of decompiling the binary code will be very close to Visual Basic code. Because of the diversity of modern code optimization and code protection methods, the result will not always be perfect. But in a dire situation like that, VB Decompiler can really help you with software analysis and reverse engineering. If you develop your software in Visual Studio 2017 (or in VS 2015, 2013, or lower), using .NET Framework - that's no problem! VB Decompiler can easily restore the code structure from the assembly tables and will be useful for disassembling and analyzing the IL code of Visual Basic .NET, C#, or other .NET assemblies. VB Decompiler does not require that you install .NET Framework. It works fine on any 32-bit or 64-bit Windows system, as well as on any 32-bit or 64-bit Linux system (with Wine), without requiring that you install any additional software. 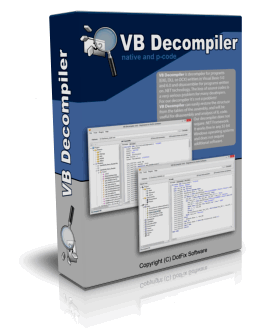 As you can see, VB Decompiler is an ideal source code analyzing and restoring tool. It is a must-have for VB developers who value their effort, time, and money.